Singapore’s MRT network consists of five different lines and has a total of 118 stations in operation. SMRT operates the North-South Line (NSL), East-West Line (EWL) and Circle Line (CCL). The other lines that complete the network are the North-East Line (NEL) and the latest addition, the Downtown Line (DTL). In 2015, SMRT had a total of nine service disruptions that lasted more than 30 minutes across its MRT network distance of 129.4km, an average of 0.0696 disruptions per km. Instead of the absolute number of disruptions of more than 30 minutes, the “Disruptions of more than 30 minutes per km” metric could be a more useful measure of reliability, as certainly the length of the line (plus its age, number of stations, number of trains, number of passengers etc) should factor into calculations of reliability. Our observations of the disruption statistics of the MRT network notwithstanding, we continue with our efforts to improve overall rail reliability and we are committed to reducing the total number of disruptions. What SMRT is doing about longer disruptions and power-related issues? Of the seven NSL and EWL disruptions that lasted more than 30 minutes in 2015, more than half (53%) were traced to power-related issues. The rest were caused by train faults and signal faults. Our efforts to address these faults include the progressive upgrade of older trains and upgrading the signalling system. In view of the higher passenger carrying capacity that will soon be made possible by the upgrading of the signalling system and the introduction of more new trains in the next two years, the upgrade and renewal of the Power Sub Stations on the NSL and EWL network has been made even more urgent. We have started upgrading and renewing our power network since early 2015. These sub station upgrades will help address the cause of power delays lasting more than 30 minutes when the work is completed by the end of 2018. The Third Rail System which supplies power to the trains is currently being upgraded to an improved design, which will increase its robustness and maintainability. We began these upgrading works in 2015. We are working on replacing the entire Third Rail system on the approximately 200-km track length (in both directions) of the NSL and EWL by March 2017. As of 12 April 2016, about 27% on the EWL and 6% on the NSL have been upgraded. As part of joint efforts to address power-related faults, SMRT and LTA have also consulted experts to improve the resilience of the electricity lines that provide power to MRT trains and stations. (Please click to view the “Independent Advisory Panel completes review of rail power supply system” press release from LTA). 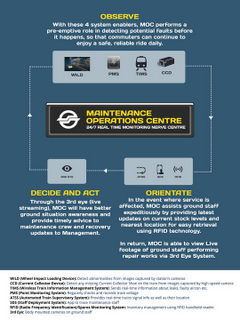 SMRT will work closely with LTA to implement these design improvements as part of the renewal programme for the NSL and EWL power system. Against this backdrop of upgrades, renewal and enhancements to the third rail system and power sub stations, it’s important that we also focus on condition monitoring and predictive maintenance technologies. When fully implemented, our engineers at the Maintenance Operation Centre will be able to leverage on this capability to monitor, predict and pre-empt faults, and attend to them quickly when they do happen. 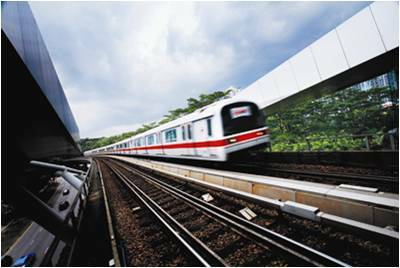 From 5 June 2016 to 18 December 2016, train services at 13 stations along the NSEWL – Joo Koon to Queenstown on the East-West Line (EWL) and Bukit Gombak to Jurong East on the North-South Line (NSL) – will commence service up to one hour later than usual on Sundays, except on public holidays. Train services at these stations will start by 7am. Currently, our project teams, track patrol teams and maintenance teams have about three to four hours of engineering hours each night to carry out works to renew and upgrade the system, in addition to carrying out regular maintenance needed for daily train operations. The later opening will enable these teams to gain the equivalent of 29 additional maintenance nights over the 6-month period. This translates into 2,320 more sleepers and an additional 3,230 metres of third rail that can be replaced. The EWL sleeper replacement project is on track for completion in early 2017. Commuters are encouraged to plan their travel to start after 7am on Sunday mornings where possible. For commuters who must travel before 7am, they can use the existing bus services to get to other train stations; or use the Circle Line and Downtown Line to get to the city. 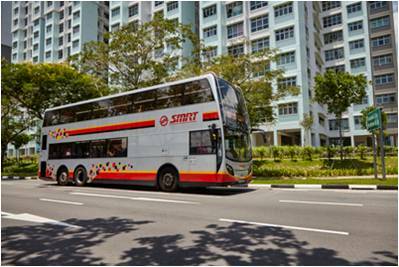 SMRT has also arranged for a new parallel bus service to ply the route from Joo Koon to Bukit Gombak in both directions. More information of the new parallel bus service and fares will be made available within the next few weeks. To date, SMRT has replaced half of the 92,000 timber sleepers on the EWL with more durable concrete ones. 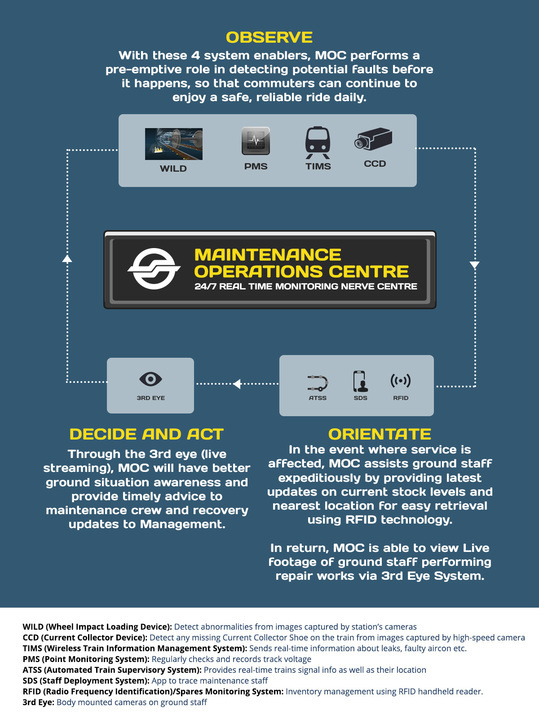 This steady progress is made possible by the additional 30 minutes every night that our engineers have gained from early closure of some EWL MRT stations since November 2015. Apart from sleeper replacement, SMRT is also carrying out other rail renewal projects such as third rail replacement and re-signalling along the NSEWL. While the various parts of the track are being renewed, track patrols and maintenance work will continue. The various project teams, track patrol teams and maintenance teams compete for the limited engineering hours available every night between the end of service and the start of service the following day. To accommodate the track access necessary for the engineering teams to carry out these works, SMRT will commence train services at the western sector of the NSEWL up to an hour later every Sunday. Commuters are advised to check for travel updates before starting their trip. Information will be available on the SMRT website, SMRT Connect, LTA and SMRT Facebook and Twitter accounts, LTA Traffic News and MyTransport.SG.